Bathtime fun toys. Squirt & blow bubbles. Squirt, squeak and float. 3 fun characters. Colours & shapes stimulate the senses. Helps develop hand-eye coordination. 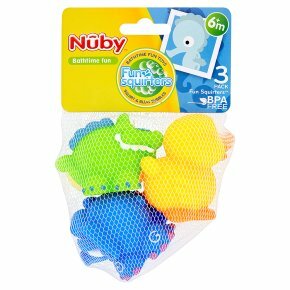 BPA free.This Nûby\ toy teaches coordination, development and enjoyment. Development experts tell us that colour and sound are most important to the first months of baby's life. This toy is designed with your baby in mind. Exceeds all government safety regulations and standards. WARNING: PREVENT DROWNING. ALWAYS KEEP BATHING CHILD WITHIN ARM'S REACH. Always use this product with adult supervision. Please remove all packaging and ties before use. Please retain this packaging for future reference.